Pressure cook the potatoes for 3 whistles. Remove from the heat, drain the water and peel off the skin of potatoes. Dice into big cubes. Heat oil in a kadhai and temper mustard seeds. Add curry leaves and chopped capsicum. Fry till it becomes soft. Add sliced onions and fry for 2 mins. Add ginger-garlic paste, turmeric powder, coriander powder, red chili powder and salt to taste. Mix all and add diced potatoes. Add little water and cook it covered for 5-10 mins. Stir it frequently. 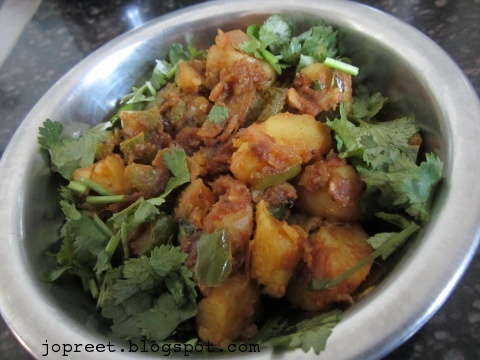 Garnish with chopped coriander and serve hot with any rice varieties of roti. 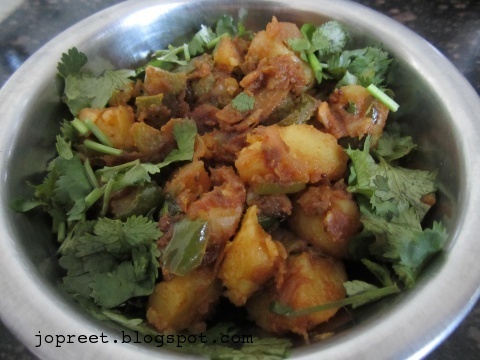 super yummy, lovely n flavorful…. This curry looks very temtping. superb!i get its aroma and want some.. I am certain this will taste yummy.Adding into my TO DO list.Thanks.